HMH Books for Young Readers, 9780544234390, 384pp. The vivacious Jacky Faber returns in the tenth tale in L. A. Meyer's Bloody Jack Adventures, a rip-roaring young adult series applauded for its alluring combination of adventure, romance, history, and humor. Once again under the thumb of British Intelligence, Jacky is sent to Spain to spy for the Crown during the early days of the nineteenth-century Peninsular War. She finds herself in the company of guerrilla freedom fighters, poses for the famous artist Goya, runs with the bulls, is kidnapped by the Spanish Inquisition, and travels with a caravan of gypsies . . . all while hoping to one day reunite with her beloved Jaimy Fletcher. L. A. Meyer (1942–2014) was the acclaimed writer of the Bloody Jack Adventure series, which follows the exploits of an impetuous heroine who has fought her way up from the squalid streets of London to become an adventurer of the highest order. Mr. Meyer was an art teacher, an illustrator, a designer, a naval officer, and a gallery owner. 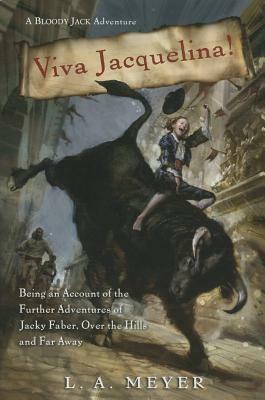 All of those experiences helped him in the writing of his curious tales of the beloved Jacky Faber. Visit www.jackyfaber.com for more information on the author and his books.